Do you enjoy The Inbetweeners? Repeats of the popular British sitcom The Inbetweeners have been screening in Australia on iView. If you watched the show, or are still watching it, do you like it? Why, or why not? 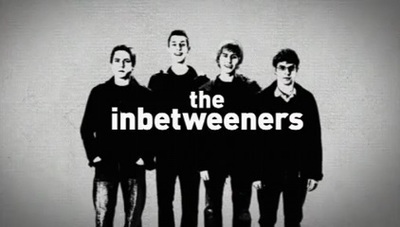 The Inbetweeners title card, Bwark Productions. Fair use. I've only seen one episode, and that was season three. I thought it was okay, but I don't quite see what the fuss was about. I've seen only snippets of the show, but they were enough to convince me of the show's vulgarity. I say it's rubbish. Favourite Doctor Who spinoff show? The Wil Wheaton Project- will you be watching?